A lot of things got in the way of Lyric's training schedule these past two weeks. Some things you just can't control and you have to learn to be flexible.We did try something new this evening though. Lyric has been saddled and bridled at the tree four or five times now and pretty much takes everything in stride. Every time I've saddled her, I have reinforced that I expect her to stand still while I'm working ...unless I ask her to move, she shouldn't move. Those of you who've had to try and dress a squirming toddler will appreciate the concept. A toddler who won't be still and cooperate with getting dressed is frustrating. But a 1000-pound horse that won't stand still and cooperate with being saddled can go from frustrating to dangerous in a heartbeat. So it's a lesson we're rehearsing every time she's saddled. Sometimes doing the same old thing but in a new place will make horses a little antsy. A change of scenery, a change in the routine, even a change in the weather can affect their mood. Changing things up on purpose early in the training process can help a young horse learn to take change in stride. So today, I decided to change things up a little for Lyric. While the horses were still eating, I put the saddle and blanket she'd been wearing up in the front paddock at the round pen. When they were finished, I got Lacy and Lyric and brought them to the tree, just like we've done for the past three weeks. But this time, I saddled and bridled Lacy and then led her around the house to the round pen. I left her up there and went back to walk Lyric up. Once inside the round pen, I draped Lyric's lead rope over the rail next to Lacy and started brushing Lyric down for the saddle. This was routine and she didn't fidget much until two teenagers on a four wheeler came down the road and turned around in the driveway. Lyric had to look at what all the racket was, but the only thing she moved was her head so that's okay. I got her saddled up in no time and walked her a few steps before tightening the cinch all the way. As a precaution, I pulled it a notch tighter than usual tonight because I intended to turn her loose in the round pen. If a cinch is too loose and a horse gets too rambunctious, the saddle can roll under the horse's belly. That makes for a really scary experience for a young and can be really hard on a good saddle so I wanted to make sure it was snug. But she didn't act up at all which is great. I unsnapped her lead rope and left it on the rail. She was loose but didn't seem to realize it at first. After a minute or two, she dropped her head to sniff the ground, but still just stood there. I petted on her for a few more minutes and then turned to walk out of the round pen. She followed me as if still tethered by a lead rope. When I went out the gate and closed it before she could follow me, she looked a little surprised but not upset. I walked down the rail on the outside to get Lacy and Lyric just followed along. While I was adjusting Lacy's saddle and attaching her reins, Lyric decided we were boring and wandered off to the center of the pen to nibble grass. So I got on Lacy and started riding around the outside of the round pen hoping to get Lyric interested in following us again. She ignored us. So I moved Lacy inside the round pen and we rode all around Lyric. I ignored Lyric unless she was in the way of whatever maneuver we were working on and, when that happened, I just rode Lacy through her as if she wasn't there. If I had been riding any horse but Lyric's own mama, she might have taken offense at being pushed ...she tends to have a rather high opinion of herself. But I was pretty sure she would be submissive to her own mama and, even if she got uppity, I knew I could move her mama quick and easy enough to avoid a wreck. I was only in the saddle on Lacy for 30 minutes and Lyric probably only wore her saddle for 45 minutes. Neither of them worked up a sweat but it was still a very good session all the way around. It was good for Lyric to wear the saddle while she was free to move around and good for Lacy to answer up to my cues regardless of whether Lyric was in our way. When I was done, I got off of Lacy, unsaddled her and left her on the outside of the round pen. Then I went back, snapped the lead rope on Lyric and walked her over to where Lacy was standing so I could unsaddle her too. Until tonight, I've been slow and deliberate when unsaddling Lyric, always mindful not to let stirrups or straps flop against her and startle her. But tonight, I decided to quit coddling her so much. I unfastened the cinch and let it fall behind her front legs while I folded the strap up in a 'necktie' through the ring on the saddle. Then I moved to her right side and secured the dangling cinch to the tab on that side of the saddle and pulled the saddle and blanket off from the right side. I carried them around behind Lyric and tucked them through the rail on the pen. She stood quietly through the whole process like like she'd done this all her life. I didn't really have a set timetable in mind when I started this training process and lots of things have kept me from working with Lyric three times a week as I'd planned. But even the unplanned slack time is good because it hasn't seemed to affect Lyric's progress. She learns quickly and retains what she's learned even if there are long gaps between sessions. That reassures me that she's going to be one of those horses that can be out in the pasture for months at a time and still remember all her manners and maneuvers when you saddle her up. It's a good thing because tomorrow I am leaving town for four days due to work. Yeoldfurt is going to have his hands full just keeping up with all the chores that I normally handle when I'm here. I doubt he'll have time to mess with Lyric until I get back. But I know on Saturday when we have our next lesson in the round pen, Lyric will pick up right where we left off. Lyric's official training began a week ago last Sunday with some basic sacking out (desensitization) exercises and some hang time on the 'thinking tree...which is a big live oak tree out back. We call it the 'thinking tree' because we use it to tie horses when we're saddling or unsaddling or when they need a lesson in patience. They're not tied directly to the tree. We have lengths of chain draped over two stout branches on opposite sides of the tree. At the end of each loop of chain is a tie ring. When we 'tie' a horse to the tree, they are really not tied at all. The end of the lead rope is pushed through the tie ring and a tongue in the loop provides resistance if the horse pulls back or moves away from the tree. How much resistance depends on how the rope is fed through the ring, but this is an excellent training tool for a horse to learn to stay where you put them. Each evening's lesson began with Lyric on one side of the tree and her mama, Lacy, on the other. Lacy is there just so Lyric won't be anxious about being separated from her herd and can concentrate on whatever we're trying to teach her. The first day, we just worked on patience. A little grooming, a little petting, but a whole lot of standing and waiting for something new to happen. The object was just to establish a routine. I also took the opportunity to adjust the bridle Lyric would be wearing so that it fit her properly. The technical term is really headstall, not bridle. Bridle would be the whole assemby, headstall and bit. But I wanted to make sure the headstall fit before I attached a bit so that it would be as comfortable as possible the first time Lyric wore it. 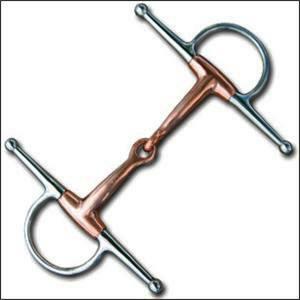 The bit we are starting out with is a full cheek snaffle with a copper mouthpiece. A snaffle is a broken bit which means the metal part that goes in the horse's mouth is hinged in the middle which allows the two sides to move independently, which gives a rider the ability to send more clear direction to the horse. The 'full cheek' refers to metal bars that extend above and below the bit on the outside of the horse's mouth ...preventing the bit from being pulled through the mouth and aiding in directing the horse's face. Once the headstall was adjusted to fit, the bit was attached and Yeoldfurt put it on her. She was unsure at first. But with patience and persistence, she figured it out. As soon as the bit was in her mouth, she instinctively mouthed it and played with it, trying to figure out what it was and why it was there. She was probably also trying to spit it out. We just let her wear it and play with it for a few minutes until she relaxed. Then he gave her a honey bun so she would figure out that she could still eat with a bit in her mouth. He expected her to bite off a chunk, but she sucked the honey bun in whole. I had to laugh because you could almost see her eyebrows furrowing up as she concentrated on not dropping any while she worked around the bit. When she'd finished the honey bun and was again settled down and standing patiently, Yeoldfurt removed the bridle and told her what a good girl she was. Then he put it back on her for a few minutes. He took it off and put it back on a couple of times that evening. She learned several things that first day ...how to accept a bit, how to carry a bit, how to eat around a bit and that it was okay to let us put it on because it wouldn't hurt her and we would eventually take it back off. Her next official lesson was on Thursday and Yeoldfurt was at work so it was just me that day. I bridled her up with no problem. I proceeded with our usual grooming session but with me standing on the mounting block next to her instead of on the ground. The purpose of standing on the mounting block is to teach her that it's okay for me to be moving around above her. Young horses that have never been ridden are often spooky about sudden movements from above. It's a new experience for them. So by standing on the mounting block, I am making myself considerably taller than she is used to seeing me and am able to reach even the far side of her with the brush. That's another important lesson for a young horse ...that we can stand on one side of them and touch them on the other side. I'm preparing her for the day I stand on her left side and throw a leg over her to get on. If I don't teach her I can be on two sides at once, she's liable to go rodeo on me. Last Saturday was her third official lesson and we progressed to letting her wear a saddle. We followed the same routine we had established the other days, bringing her and Lacy to the tree and then grooming and putting her bridle on. On Saturday, we added the saddle. She did really well for her first time. We let her sniff the saddle and pad before we placed them on her back and we were careful not to let the stirrups or straps flap around too much and startle her. Once she is completely comfortable with the idea of wearing a saddle, we'll make a point to wiggle the saddle and jostle the stirrups so she gets accustomed to those sounds and sudden movements. But the first few times, the goal is just to let her understand the process and that the saddle is not going to hurt her. I saddled her again tonight right before Yeoldfurt got home from work. I was careful about the stirrups and cinch strap but moved a little faster than I did on Saturday. She did real well and was all tacked up and standing patiently when Yeoldfurt pulled in the driveway. She's really has a good attitude so far and is soaking up the attention. I'll work keep working with her at the tree for the rest of this week. Then next weekend, we'll take her out to the round pen to saddle her up and turn her loose. If she has any inclination to buck with the saddle, that's when she'll do it. If she does, she does ...she'll only teach herself that she can't buck it off. But I'm hoping she maintains the same quiet attitude she's had so far and just waits for us to show her what's next.